Recently I completed my MSc-thesis. 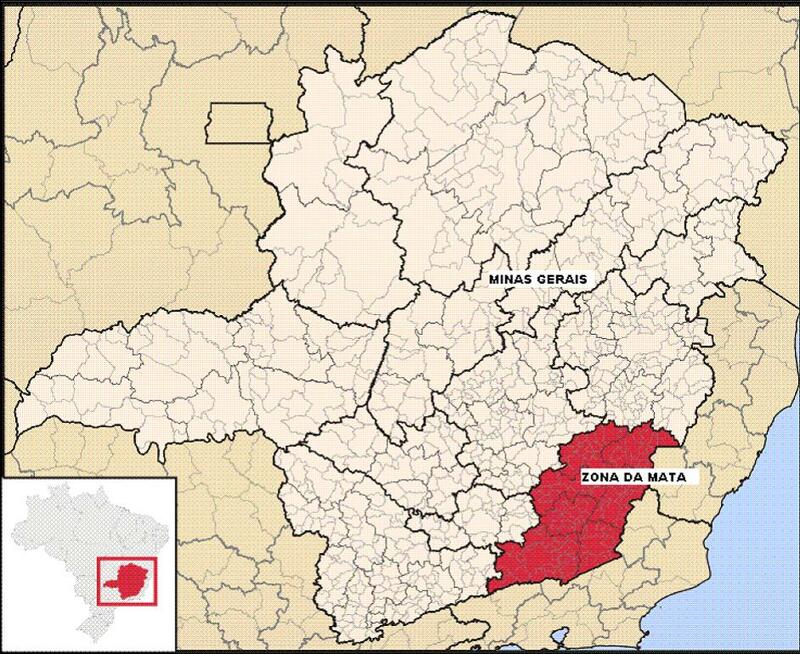 The thesis research is set in the municipality of Araponga in Brazil, where (re)peasantisation occurred and continues to occur. Here I describe some of the findings of my research. When interested you can downlaod a pdf of my thesis ‘Invisible peasant movements: A case study of (re)peasantisation in Brazil‘. When I started to read about the peasantry there were two major things that occurred to me as striking. First, in policy peasants are often considered as a group of laggards: who are unable to take care of themselves and therefore need social assistance; who rely on primitive forms of technology and therefore must be modernized; or who are impeded by a stagnant, traditional mentality and must therefore be converted into small entrepreneurs. The peasant mode of farming is seldomly considered in its own right. Second, in academic theory peasants are predicted to disappear, weaken or live a life of poverty as a result of their inferior mode of production and their helplessness. Departing from the assumption that actors are driven by a specific economic-rational logic, neo-liberal approaches roughly theorise that peasants commoditize, compete with other farms as a result of which there will be regional growth. Tradition or culture can block economic rationality and the transition from peasant to entrepreneur. The peasant will then be doomed to poverty. In contrast to the neo-liberal approach, neo-Marxist approaches, most of which also assume that the peasant is driven by an economic logic and commoditize, theorise that commoditization will either lead to the destruction of the peasant enterprise or to a fate of poverty. This is the result of price fluctuations, squeeze in agriculture (caused by the trend of decreasing produce prices and increasing input prices for farmers), or newly emerging food networks (through which income from weaker, peasant, parts of the chain are squeezed in favour of the more powerful, retailers, part of the chain). These predictions and preconceptions contradict with what happened in Araponga, a rural municipality in the state of Minas Gerais in Brazil where there was a rise in the number of peasants and an increase in welfare. The objective of this thesis was to find out how this was possible: how had (re)peasantisation occurred in Araponga. As both neo-liberal and neo-Marxist approaches deem (re)peasantisation impossible, I needed another approach, one that did not make the assumptions of economic rationality and commoditization. I took the notion of agency as a starting point where peasants are taken to be knowledgeable about constraints they face and capable of devising ways of dealing with them (Giddens 1979). In accordance with Long (2001) agency was taken to consist of (and limited to) the peasants’ social and material networks. I focused on the labour process which looks at how natural resources are mobilised for the (re)production of the farm through institutional, ecological and community/family relations. The research strategy was a case study for which semi-structured interviews and life histories were the core data gathering techniques. For this, nine farmers that had undergone (re)peasantisation were selected and a sample selected that showed both the average situation but also reflected the variety of changes that occurred. The data was complemented with questionnaires and cross-checked with observations and informal talks with other farmers in Araponga. My results show that (re)peasantisation was in the first place driven by a loosely defined quest for space. Most farmers that had undergone (re)peasantisation were landless sharecroppers who felt that, despite the hard work and long working days, they still led a restrictive and insecure life. These sharecroppers tried out various things to improve their situation, for example moving to the city. They were not content with most of these attempts: life in the city was found also found to be harsh. As they tried out things, they increasingly realized that space had to be sought in the countryside. There, they increasingly identified that their constraints lied in the relation with their landlord. As sharecroppers they owned no land but had to rent it. The renting agreement was such that they were allowed to keep 50% of the harvest, they had to continue the work even when it was raining or when they were sick and that they were not allowed to choose what crops to plant and decide how to carry out farm activities. This realisation led to the problematisation of their relation with the landlord. This was further strengthened when the Communidades Ecclesiais de Base (CEBs) were established in 1979. These were small autonomous groups of a few neighbouring families, who prayed and discussed everyday-life problems, founded by a left wing of the Catholic Church. Through the CEBs sharecroppers became acquainted with liberation theology, which can perhaps best be described as a mixture between Christianity and Marxism. These developments increased agency in two important ways. First, it led to a social/cultural redefinition of agency. Whereas sharecroppers first took their situation as a given they now believed that they could (and should in the name of social justice) change it. Second, it led to an expansion in networks: where sharecroppers previously only had close contacts with relatives, they now also became close to CEB colleagues. This quest for space drove a learning process which crystallized into the foundation of new organizations and new social relations and arrangements, both of which increased agency. On the collective level a group of sharecroppers, inspired by stories of liberation theology, began to search for unions in the hope to find inspiration and practical guidance to found their own. One of the group members knew a person, who knew a person, who knew a person that was a member of a union. They spoke to this union but soon found out it was a teachers union, which to their surprise did not share their cause. They were sent from one union to the next and increasingly understood what it was that unions did and also increasingly came closer to unions that shared their cause. After a few years, in 1989, the Arapongan farmer union was founded. The union offers legal support to the sharecroppers. Several other organizations emerged from the same networks and through alliances with other organizations. 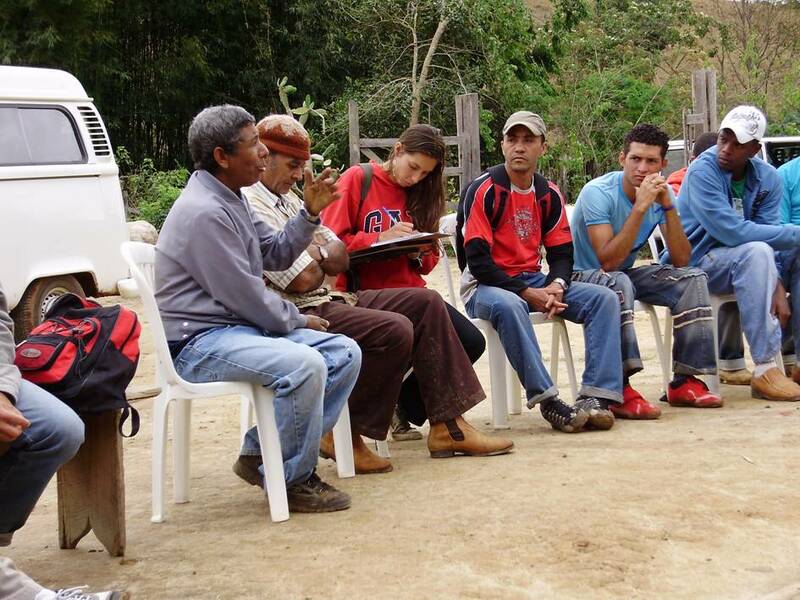 Together these organizations facilitated peasants to purchase inputs and land, supported the development of their production system, and removed some municipal policy biases against the peasantry. So, at the collective level, the quest for space led to an increase in number of organizations which together created a favorable environment for peasants which in turn increased their capability to act, or; their agency. On individual level, sharecroppers have strategically used existing social relations and created new social relations to gain control over financial capital, land and labour, which allowed them to establish their own farm. Sharecroppers obtained financial capital, required to purchase land and farm capital, by sharecropping and by loaning money from relatives and new friends made at the CEBs. The next step was to buy land. The problem with this was that only large, unaffordable areas of land were for sale. To overcome this difficulty, sharecroppers pooled their money to collectively purchase land and then divided the area. This type of purchase was institutionalised in the conquista da terra movement through which 110 farmers bought a total of 498ha (data of 2008). Once peasants had acquired land, they used their own labour to carry out most tasks. They also received help from their family for other tasks and used troca dias or community exchange labour for other tasks such as harvesting and weeding. With their own farm, peasants were able to keep all of the harvest and had the freedom to: allocate their own time, choose which crops to plant and what practices to pursue. In conclusion, peasants used family and community relations to seize control over financial capital, land and labour thereby taking control over the production and reproduction of the farm into their own hands. This development further increased autonomy and the capability to act (or agency). Seu Nenem (first from left) and Seu Cosme (second), pioneers and initiators of the conquista da terra movement, talking of the movement to a group of students. When peasants had established their own farm they faced a new series of constrains and restrictions. First, they could not plant everything as most of land they had purchased was degraded and was either unsuitable for cropping or generated low yields. Second, future yields were not secured as soil exhaustion and erosion continued to take place. Third, peasants experienced a squeeze in income as prices of chemical fertilisers were increasing and coffee prices did not rise accordingly. Fourth, household food security continued to be low as prices of food in the store were high. These constraints and restrictions triggered a new quest for space. As farmers tried to find ways to relieve themselves from these constraints, they increasingly realised that their farming methods stemmed from what had become the default mode of farming in Araponga, which was: the mono-cropping of coffee, the specialisation in coffee and the almost exclusive reliance on commodity markets for their inputs, produce and food. The new quest for space drove a new cycle of experimentation and learning, which in turn crystallised in several new, strategically significant practices. First, experiments were carried out, many of which aided or initiated by the CTA and Arapongan farmers’ union, to improve the soil and counter soil erosion and exhaustion. One practice that resulted from this was the planting of a specific sequence of natural vegetation for several years which regenerated degraded the soil. This enabled peasants to plant high value crops (such as coffee and maize) and to obtain higher yields. Other practices include cover crop, chop-weeding, contour planting and contour ploughing through which erosion and leaching were reduced and the productive capacity of the soil maintained. Second were practices that reduced peasants’ reliance on chemical fertilizer (and therefore their vulnerability to fertiliser price fluctuations and the trend of increasing fertiliser prices). All peasants began to plant deep rooting and N-fixing trees in between the coffee plants, through which nutrients otherwise unavailable to the coffee were made available. This required a significant amount of experimentation and several trees were rejected because they had negative effects on the coffee production. Several farmers also got a cow to apply manure to their crops. Most farmers had no experience with cattle and had to learn and experiment with the practice of keeping cattle. Third were practices that reduced peasants’ reliance on purchased food (and therefore their vulnerability to food prices fluctuations and their dependency on income from the coffee production to purchase food). All peasants began to plant fruit trees in between coffee, planted other food crops instead of (expanding) coffee and established a vegetable garden. Fourth were practices that enabled peasants to escape from the income squeeze, enabling them to capture more value. Peasants began to sell food directly to neighbours, to the community, and to a store in Araponga, instead of through intermediaries as is done with coffee. Several peasants also began to sell high quality or organic coffee for which they received more money. In summary: through their relations with nature/ecology peasants have produced soil, nutrients and food and through the use and creation of alternative markets, peasants have increased the value captured. The strategic significance of this is that it reduced peasants’ reliance on less favourable relations and enhanced their own control over production and reproduction of the farm. This not only guarantees survival but also enables peasants to produce according to their own norms, values and quality standards. This also sedimented in a more sustainable pattern of co-production which regenerated degraded soils, halted processes of land degradation, reduced pollution of air and groundwater, increased quality of crops, increased food security and enabled more people per unit of area to make a decent living. Changes in the way coffee is planted. 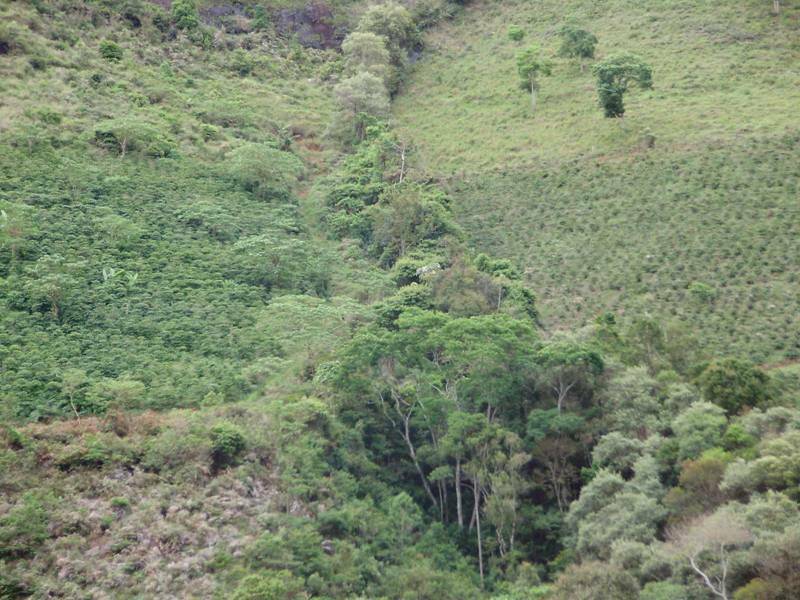 Conventional coffee (right) and the new way coffee is planted (left). These findings contradict with the bulk of theories on and policy preconceptions of the peasantry. First, the peasant in Araponga was not found to be determined by any type of relation (e.g. the market). Instead they were able to use social and natural relations to distantiate from unfavourable relations. Second, (re)peasantisation was not a linear type of development. It was neither a mechanistic reaction to market developments nor the implementation of a blueprint of (agroecological) practices. Instead, (re)peasantisation was driven by a quest for space which fed into a cycle of learning and experimentation, with failures and successes, through which agency gradually progressed. In the end, peasants in Araponga reversed the cycle of dependency and exploitation in which they were situated through the deconstruction, re-arrangement and redefinition of resources and their position in the labour process. This entry was posted in Agriculture, Education, RSO-student, Rural Development and tagged Brazil, Peasantry, repeasantistion, Rural Development, Social Movement by RSO-Students. Bookmark the permalink.